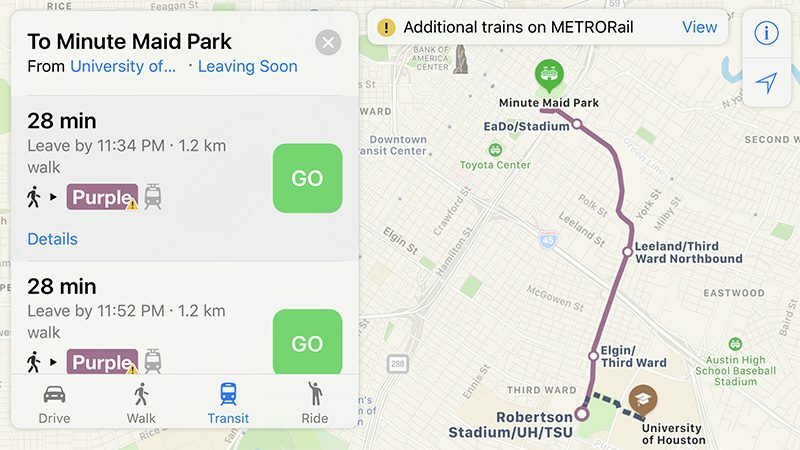 Apple Maps has been updated with comprehensive transit data for the Houston, Texas metropolitan area, enabling iPhone users in the city and select Harris County suburbs to navigate using public transportation, including METRO buses and METRORail. Amtrak also goes through Houston, as previously supported by Apple Maps. 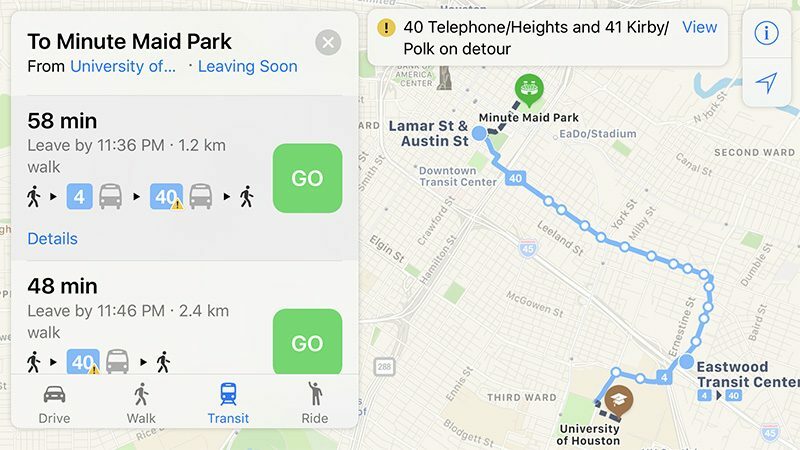 Apple introduced Transit in Maps as part of iOS 9 in select cities around the world, including Baltimore, Berlin, Boston, Chicago, London, Los Angeles, Mexico City, New York, Philadelphia, San Francisco, Sydney, Toronto, and over 300 cities in China. The feature has its own tab in Apple Maps on iOS 10 for entering directions. Transit routing continues to expand to several other cities, including Atlanta, Columbus, Dallas-Fort Worth, Denver, Honolulu, Kansas City, Melbourne, Miami, Minneapolis–Saint Paul, Montréal, Pittsburgh, Portland, Prague, Rio de Janeiro, Sacramento, Salt Lake City, San Antonio, San Diego, Seattle, Vancouver, and Victoria. Last month, Apple expanded transit directions throughout Great Britain, beyond the London area already supported. The feature now works almost anywhere in England, Scotland, and Wales, such as Birmingham, Manchester, Liverpool, Newcastle, Sheffield, Glasgow, Edinburgh, Bristol, Portsmouth, Nottingham, and Cardiff. NRG Stadium in Houston will play host to Super Bowl LI between the Atlanta Falcons and New England Patriots on Sunday, February 5. If I was in Houston for the Super Bowl I would still trust Google Maps over Apple's. ESPECIALLY WHEN IT COMES TO PUBLIC TRANSIT AND TRANSIT TIMES. Makes sense have this up right before the Super Bowl with all the visitors that will need to get around... METRO pretty much had to open the curtain. Woohoo, just in time for the Super Bowl!